Erica was born at a goat dairy farm where she would have spent her life being impregnated, giving birth and having her babies taken from her right away so that the milk intended for them could be sold. When the dairy farm closed down, Erica was lucky to be adopted into a sanctuary and from there she came to WFAS. Although she’s a little shy at first, Erica loves having her head scratched and rubbed. 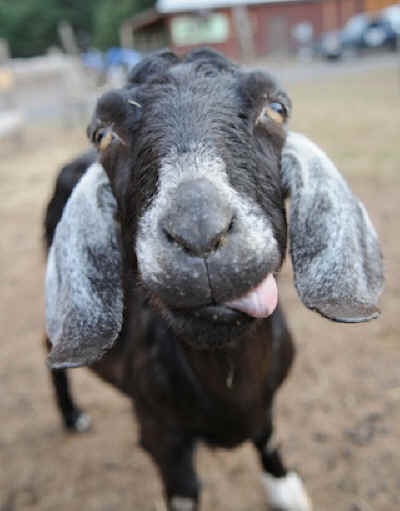 She had her horns burned off as a baby goat—a common industry practice, done without anesthesia. Despite that, bits of her horns grow in and apparently are very itchy! You can just hold your hand still and she’ll rub the top of her head against it. Erica is also a treat monster. And she has a really long tongue. She’s also lost some of her teeth so her tongue seems that much longer as she licks her lips and sticks her nose through the gate to get a piece of apple or an alfalfa cube. When she’s standing on the gate, with her head sticking through and that goofy tongue and the smile on her face that says, “Why wouldn’t you give me a treat?” the only answer is, no reason at all, as you give her one more piece of alfalfa.